These five articles are about how we made our discovery, and our journey to the treasure's site. Five people died attempting what we accomplished, in the same time interval. We walked past where they died many times. We encountered many suspicious people and our final location is within a mile of where Ruth's bullet-riddled skull was found. We have broken our story into five parts to make it easier to understand. History of the Mines and the Treasure - Gold bar caches and gold mines. Peralta Stone Map and Cross - What they are and why they are important. Research and Planning - How we went about determining what the stones led to and why they were made. How we used Google maps to plan the ground trips. Ground Trips - How we used the maps and what equipment we used to verify our findings. Summary - What we found and why we can’t dig without a permit. What we did to try to get one. The dangers that are involved in any search. What people can do to help in the search. In 2011 my wife and I were analyzing the Peralta maps and others on display at the Superstition Mountain Historical Society Museum on the Apache Trail. The maps are believed to be of areas within the Superstition Mountains. We had made some discoveries relating to one map and our success led us to believe we had a chance at solving the mystery of the Stone Map. The display is comprised of two red sandstone tablets, a red sandstone heart and a white sandstone tablet. Each sandstone block is approximately 18” (~ 45 cm) by 12” (~30 cm) and 2” thick, weighing about 25 lbs. They were found around 1949 by Travis Tumlinson in the desert near 33°15'33.75"N 111°20'28.42"W which is known as Florence Junction. Florence Junction is an intersection of Highway 60. Another piece, a heart marked in Latin, was found near the location of the first find not too long afterward. 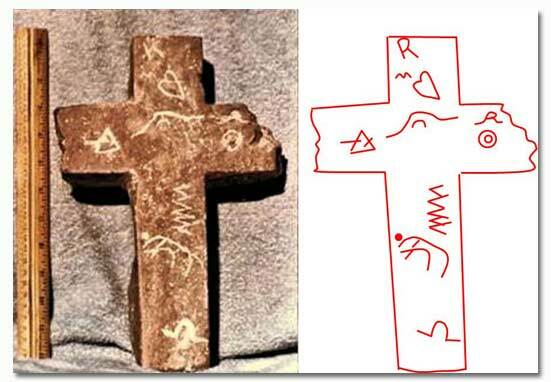 Then in 1979 Mr. Bilbrey discovered two stone crosses in a mine shaft near 33°15'26.22"N 111°20'1.17"W. These crosses fit into a cross outline on the back of one of the red sandstone tablets found in 1949. The map we studied was made of this set of six pieces, the two red sandstone tablets, the two hearts, and the two crosses. One point of confusion crept in: the white sandstone tablet. It has been admitted that it was manufactured by Mr. Tumlinson while he was in possession of the red tablets, and it was made by copying the other maps. 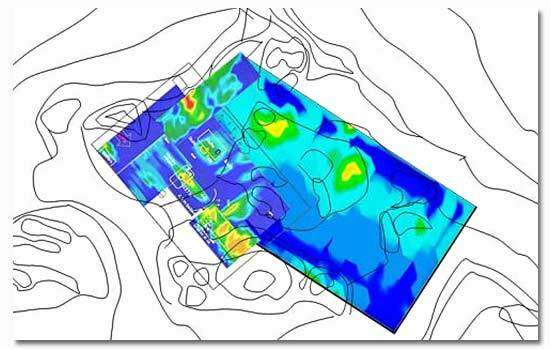 We included the white sandstone map's information in our analysis but we were suspicious of the details it provided. If the clues it provided were wrong then that map was to be ignored. All of the stone pieces have Spanish written on them, except for the heart found separately from the other tablets; it is written in Latin, hence its name, the Latin Heart. Our attention was drawn to the Stone Crosses because one of them stated the map was for the Treasure of Santa Fe. We thought the maps were about mines in the wilderness and had not heard of this other treasure. Eventually we came up with a solution that utilized all the information on all the pieces including the white tablet. It was the white tablet that led us to discover a clue in one of the red tablets. That clue was how to use the Stone Cross map to position the Latin Heart in the wilderness. We proceeded to go into the wilderness to try to verify our findings. How we arrived at this particular destination will be described in a later article. As we prepared to go into the wilderness to see if our analysis was correct we obtained a tool that images underground metal and ores. It is called a Rover UC. It makes color images of the things we would be seeking, even if buried as deep as sixteen feet. Red, orange and yellow are precious metals and blue is a hole. Green represents normal earth. 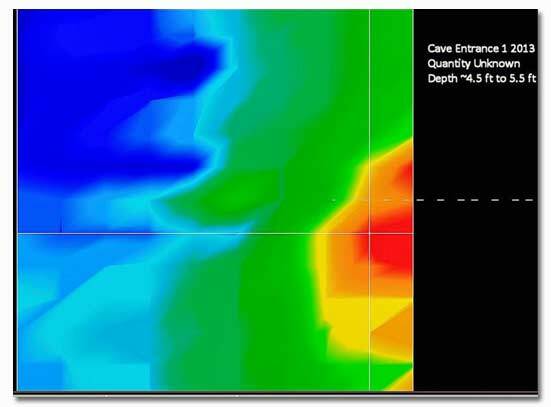 We were offered the chance to calibrate our Rover UC by using it to reveal the contents of a recently rediscovered treasure trove in a sealed mine. The discoverer described it as one mine within a group of mines in which he found a Church Treasure. The treasure was said to contain bullion, paintings, church artifacts, guns and the remains of those killed within. The mine entrance was sealed after its discovery and he needed us to verify the contents for him so he was certain of having relocated it without disturbing the site. He showed us the mine entrance. We scanned the terrain over the mine with the Rover UC. It was a blind test, meaning we didn’t know where things were. Our images of the contents of the mine matched the discoverer's description of what was in it. He even knew the tilt of the mine floor. He had the proof required to pursue his plans. We suddenly realized what a "Church Treasure" as he described it included: bullion measuring 5” by 10” by ¾”. We wondered if one of the maps we had studied matched this nest of mines. It did! It was the Burbridge map. The Burbridge Map has been authenticated and was found pasted inside the cover of an old book. It states that the mines were given to Manuel Alejendro Peralta in 1753. Mines on these old maps were indicated by circles and the trails between them by wavy lines. Our suspicions were aroused as we noted that one mine on the map was a darkened circle. We revisited our analysis of aerial photos to see if we could locate and match the map to the mines and the trails on the ground around the treasure that we had scanned. We located several mines and trails as indicated on the map. This convinced us that the Burbridge map was for this Church Treasure and that the Peralta Stones were linked to the Church Treasure. 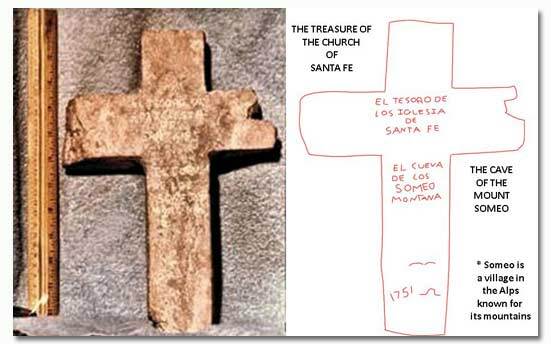 This meant to us that the Stone Map of the ‘Treasure of the Church of Santa Fe’ was likely a Peralta map. This association justified our use of other Peralta maps to fill in missing information for the Stone Map. We now expected that the treasure would include bullion. We examined aerial photos of the region and discovered other mine locations that soon convinced us that the tunnel where we tested our UC Rover was the dark circle on the Burbridge Map. That stunned us because it was the first link to a Church Treasure. 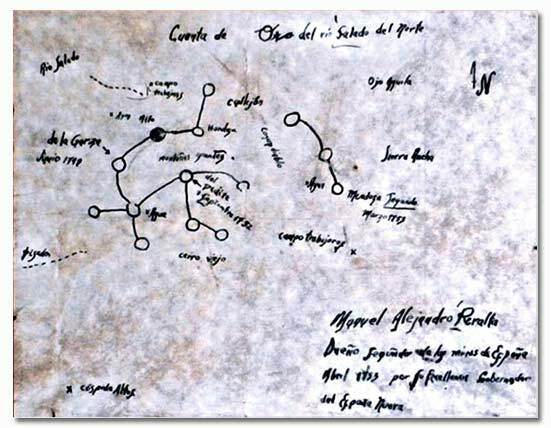 This map and the discovered treasure indicated that the Church Treasure was definitely linked to the Peralta mining activity. We backpacked into the wilderness, to our location, and discovered bullion, mines and gold ore.
We have provided a Google Earth© compatible file that you may use to view the locations mentioned in this article. Here is how to use it. If you have gone to Google Earth© and installed (for free) their Google Earth© application you can use the file. Simply start by downloading our ARTICLE_1.kmz file. Then start the Google Earth© application. Once the application is operating and the earth is displayed go to ‘File’ – ‘Open’ and open the ARTICLE_1.kmz file you downloaded. The panel on the left has all the data relative to the article and our field research in it. Note: The Superstition Mountains are east of Apache Junction in Arizona and the area is a designated Wilderness Area by Congress. This means all things within are protected by law. Anything other than hiking, camping and taking photos will require a permit from the National Forest Service. 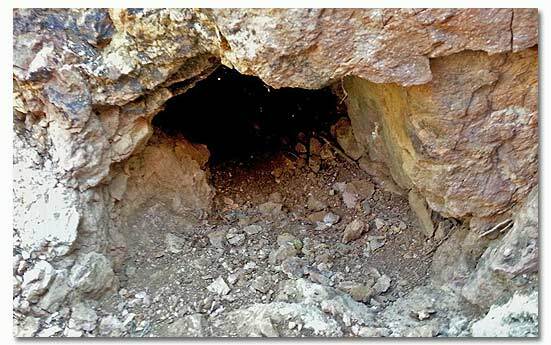 Therefore when we discuss the presence of treasure and mines please keep the law in mind, do not disturb archaeological sites.